Be the first to share your favorite memory, photo or story of Mitchell. This memorial page is dedicated for family, friends and future generations to celebrate the life of their loved one. 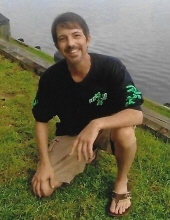 Mitchell Lee Stephens, 42, of Moss Point, MS passed away on Wednesday, March 20, 2019. He was born August 21, 1976 in Pascagoula, MS. He enjoyed fishing, cooking, and good music. He loved his family dearly and he will be forever missed. He was preceded in death by his mother, Katie McKenzie Stephens; niece, Preslea Moore; and nephews, Justin Smith and Jaxon Smith. He is survived by his daughter, Alexis Stephens; son, Lance Young; soul mate, Michelle Vinson; father, Bob Stephens; sisters, Debra (Robbie) Wood, Michelle (David) Dobbe, and Tracy (Johnny) Martin; along with numerous nieces and nephews. Visitation will be held on Monday, March 25, 2019 from 4 p.m. until 5 p.m. at Heritage Funeral Home in Moss Point, MS. Memorial service will begin at 5 p.m. in the funeral home chapel with Brother Billy Moore officiating. Heritage Funeral Home, locally owned and operated in Moss Point/Escatawpa, MS, is in charge of arrangements. To send flowers or a remembrance gift to the family of Mitchell Lee Stephens, please visit our Tribute Store. "Email Address" would like to share the life celebration of Mitchell Lee Stephens. Click on the "link" to go to share a favorite memory or leave a condolence message for the family.